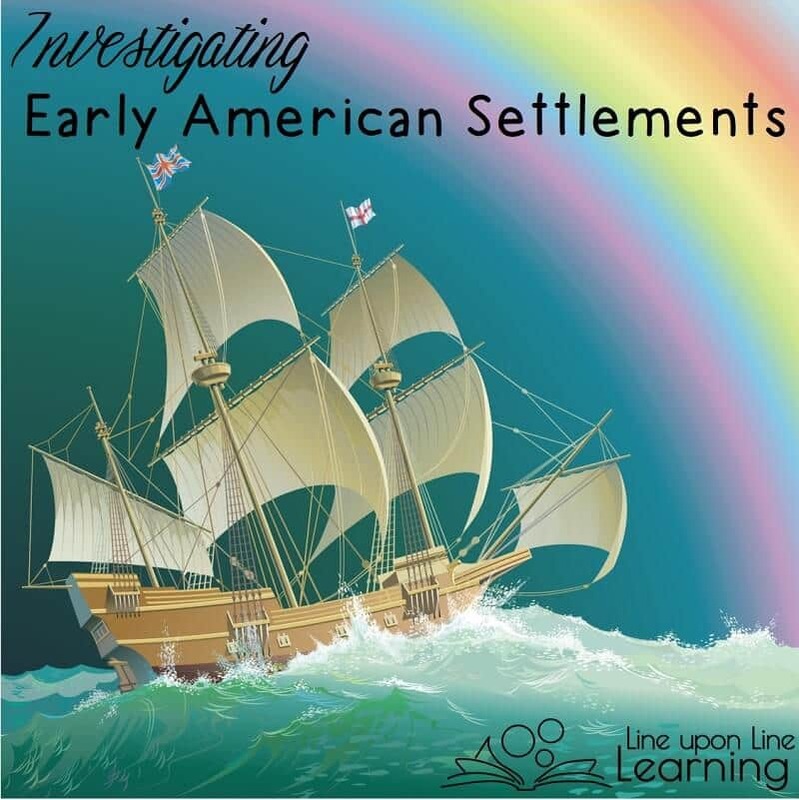 For young elementary kids, learning about the early American settlements can be a investigation of the reasons behind the success and failures of the early colonists in America. Roanoke’s mystery provides context for the difficulties of settling, Jamestown teaches about the economic reasons to settle, and the Massachusset Bay Colony of Pilgrims shows religious reasons for settling in the New World. Be detectives! Be colonial entrepreneurs! Trace the route of the humble pilgrims! 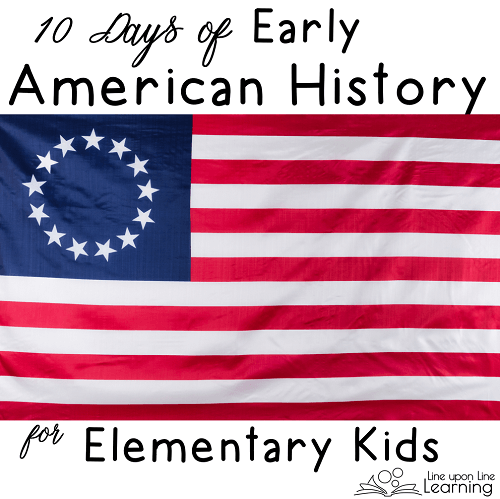 The opportunities for learning from the early American settlements are many. The first settlement in what is now the USA was St. Augustine in 1565, which is now in Florida. The Spanish set it up as a colony for settlement to claim land. The first English settlement was on Roanoke Island in 1587, a settlement that mysteriously disappeared. There are very few resources out there for young elementary kids about these two settlements. Possibly because such early history is scarce in the first place! 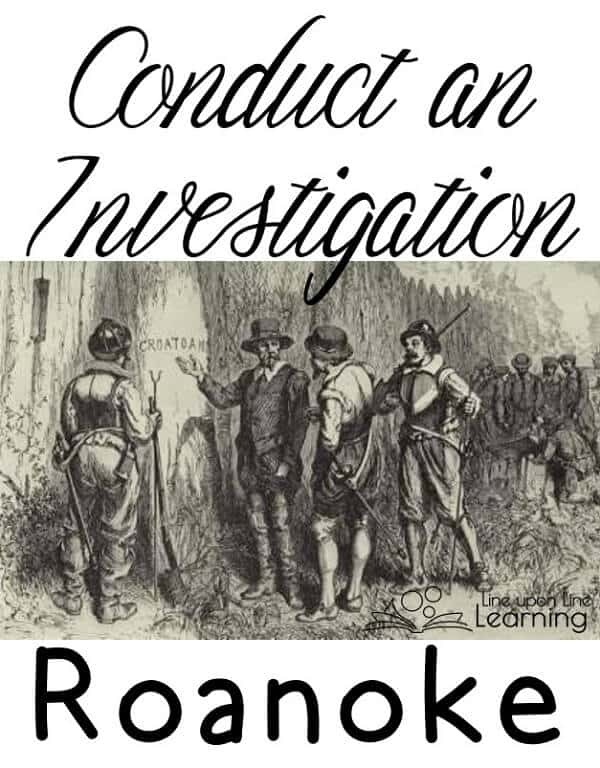 I think the Roanoke story is fascinating, and kids will love the mystery attached to it. Besides, kids love to learn about babies, and Virginia Dare, John White’s granddaughter was born in Roanoke, the first English person born in the New World on record. 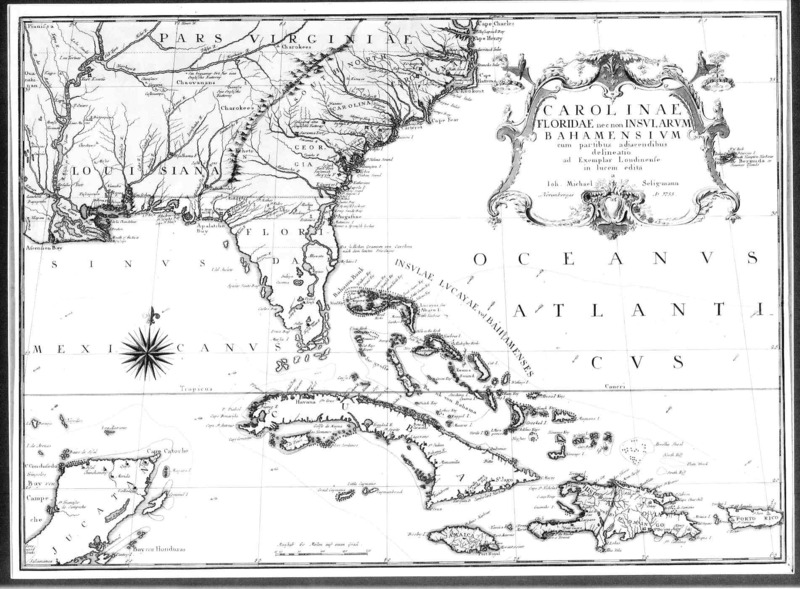 Roanoke, the Lost Colony by Jane Yolen has a high elementary reading level attached to it, but the book introduces some of the mystery surrounding the disappearance of the colonists in the three years that the European community had no contact with them. Told from the perspective of a fictionalized child with a detective father, Yolen’s picture book has just enough information about the colony of Roanoke to interest a young child, but without too many details. I like how each page had a few different types of information: a main paragraph, a box with new vocabulary words and definitions, and another “notebook” with more information. This meant we can read some or all of the text on the page, but not feel overwhelmed. More books about this about these settlements, both with higher reading levels, are listed below. Check out the History Mystery Lab for ideas on implementing an investigation into the disappearance. Although the lesson plan is geared toward older elementary children, younger elementary students can also appreciate the facts that the settlement was difficult. Look at Catesby’s map of Carolinae and examine the White and De Bry illustrations and maps to see where the settlers landed. Compare those places with the weather data for North Carolina (station 41002 is closest to the location of Roanoke). I also love the idea of reading portions of John White’s report of his return to Roanoke (another, annotated version on North Carolina site). But, find other primary and secondary source to compare to his report. For example, see details on John White’s map, recent archaeological finds, analysis of the tree rings around Roanoke, rumors about the lost colony written by a Jamestown resident in 1612. As the first permanent English settlement in America, Jamestown provides plenty more ideas for learning available! 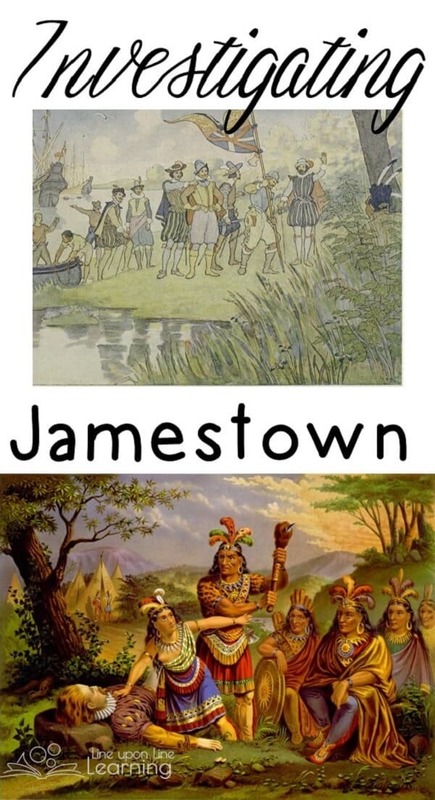 The Jamestown Settlement website (historyisfun.com) has lots of analysis, investigation, and role play learning ideas relating directly to Jamestown. These hands-on activities can bring history to life. For young kids, I also love reading the story A Lion to Guard Us by Clyde Robert Bulla. In this middle grade reader, a young girl in England struggles to keep her brother and sister together after her mother passes away. Because her father was a part of the advance group that traveled to Jamestown, she determines to get her young family to Jamestown as well. Reading this book together helped my kindergartner internalize what England would have been like, how traveling on a ship may have been, and the ways in which settling in Jamestown was a stark contrast to life in England at the time. Although it was written at a second or third grade reading level, it does not talk down to the reader, and the somewhat complex story provides for an interesting adventure. Online activities activities are many. Try the American in 1607 town tour at National Geographic, the Jamestown Online Adventure (can you survive? ), the Virtual Jamestown page, a PBS Jamestown Interactive, and the On the Trail with John Smith activity. Here are some more books about Jamestown. Those with an asterisk are longer or are chapter books. I have purposely not included every book I’ve found or read about Jamestown. There are simply too many out there! These are my favorites, and I believe that together these books show a comprehensive picture. For teenagers or adults, I’d also strongly suggest Pocahontas by Joseph Bruchac. Since Bruchac is a Native American himself, he has clearly done his research to accurately portray the culture. You’ll note I did not include the Disney movie about Pocahontas on the list. I have issues with it! First, we learn about the departure of the pilgrims and the voyage of the Mayflower in Tattered Sails by Verla Kay and Dan Andreasen. Although Kay never mentions either the Mayflower or the pilgrims by name, in her book, she depicts children in a crowded and dirty city, a crowded and dirty boat, and then the open expanse of land. I also liked the depiction of all the work the children had to do once they arrived in the new land. Kay writes in unpretentious rhyme that makes Tattered Sails a delight to read. Despite the lack of historical details in her text (or maybe because of what is lacking), her book was a good place to start in our discussion of the pilgrims because it provided discussion as we compared and contrasted their homes. Pilgrim Cat by Carole Antoinette Peacock and illustrated by Doris Ettinger (Albert Whitman 2004) is prose, and it does not read as well as Tattered Sails. 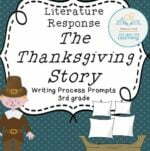 But it does provide a different perspective on Thanksgiving by telling the story of traveling on the Mayflower, settling in Plymouth, working, and celebrating the first Thanksgiving through the perspective of a girl who adopts the ship’s cat. The young girl Faith Barrett gets ill, and the cat helps comfort her. As Squanto teaches her to plant corn, the cat sneaks some of the fish from his bucket. Although the book is full of historic details, it comes across as a story about a girl and her cat, a nicely accessible way of approaching history. Alice Dagliesh’s The Thanksgiving Story (illustrated by Helen Sewell) is another book about a child’s family traveling to Plymouth. Because it is has dated illustrations, it was not a favorite for my son. Ironically, The Thanksgiving Story won a Caldecott Honor for its illustrations. It has lots of details, and we read it over the course of two different days. The story is based on a real family that traveled on the Mayflower. In general, it’s a wonderful selection for the season, but because of the abundance of text, it is not one that all younger children will enjoy. 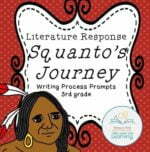 Finally, we learned more about Squanto by reading Joseph Bruchac’s masterpiece Squanto’s Journey (Harcourt Children’s Books, 2000). Illustrated by Greg Shed, this gorgeously illustrated book tells the story of Thanksgiving from the perspective of a young man who had grown up in the area that became Plymouth Bay. 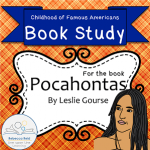 Squanto was kidnapped and taken to Europe as a young man, and this is his story. Once again, because Bruchac has native heritage, he addressed a needed aspect of the first Thanksgiving, the displaced natives that once lived on the coast of Massachusetts. Squanto’s Journey is my favorite version of the first Thanksgiving and the pilgrims because somehow I feel it is most accurate. There are many, many more picture books and chapter books about the Pilgrims and Thanksgiving. These are the most intriguing historical choices for those wanting to approach the events from a historical perspective. Here are two more higher-level books. Together we made some paper models using a Easy Make-and-Learn Colonial Times book . We made a model of the ship and a diorama of the First Thanksgiving. Here are more hands-on learning activities about the Pilgrims and the First Thanksgiving. P.S. I’ve made a few products that relate to the colonies and to Thanksgiving and the Pilgrims. Check them out in my Shop.